Washington D.C., October 15, 20011 – A Venezuelan employee of Cuban exile and indicted terrorist Luis Posada Carriles conducted surveillance on targets “with a link to Cuba” for potential terrorist attacks throughout the Caribbean region in 1976, including Cubana Aviación flights in and out of Barbados, according to documents posted today by the National Security Archive. At least four targets identified in the surveillance report — including the Guyanese Embassy in Port-of-Spain, Trinidad — were subsequently bombed during the bloody summer of anti-Castro violence in 1976, and a Cubana jet was blown up in mid-air on October 6, 1976, after taking off from Seawell airport in Barbados. Posada faced charges in Venezuela for the airplane bombing, but escaped from prison there in 1985, participated in the White House- and CIA-sponsored Iran-contra covert operations in Central America in the 1980s, and illegally entered the U.S. in March 2005. On May 8, a federal judge dismissed all immigration related charges against him citing prosecutorial misconduct and incompetence and allowed Posada to return to Miami a free man. The Department of Homeland Security, however, has placed him on the “no-fly” list. The Archive also posted additional investigative records generated by police authorities in Trinidad following the bombing, including drawings by Posada’s employee, Hernán Ricardo Lozano, and handwritten confessions by a second Venezuelan, Freddy Lugo, that describe how Ricardo molded plastic explosive into a toothpaste tube to destroy the plane, as well as Ricardo’s attempts to reach Posada via telephone after the plane went down. Ricardo was an employee at Posada’s security firm in Caracas, Investigaciones Comerciales y Industriales (ICA). According to the then police commissioner of Barbados, Orville Durant, who traveled to Caracas after the bombing, this surveillance report was found during searches of Posada’s home and office. (Venezuelan authorities matched the handwriting to notes Ricardo had penned to a girlfriend at that time.) Ricardo and another Venezuelan, Freddy Lugo, were subsequently tried and convicted in Caracas for placing bombs on the flight before they deplaned in Barbados. Posada and another Cuban exile, Orlando Bosch, were also detained in Caracas as the masterminds of the crime. Posada escaped from a Venezuelan jail in September 1985; Bosch was released after twelve years in prison in 1988. Bosch has lived freely in the Miami area for seventeen years; in various interviews he has all but admitted a role in the bombing of flight 455. Posada was freed on bail on April 18; on May 8, a federal judge tossed out charges of lying to immigration authorities regarding how he arrived in the United States. A grand jury in New Jersey is weighing evidence of Posada’s role in orchestrating a series of hotel bombings in Havana in 1997, using plastic explosives hidden in Prell shampoo bottles and shoes. In the course of their investigations, Venezuelan authorities conducted a handwriting analysis of the surveillance report on Colombia, Panama, Trinidad, and Barbados [see document 1] uncovered during a raid in Caracas. 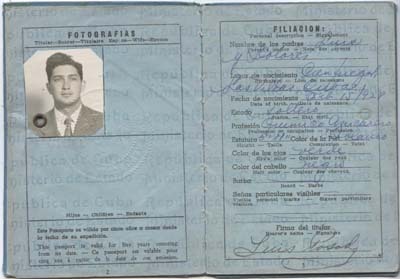 They compared this document to a letter signed “Hernan” to Ricardo’s girlfriend Marines Vega, and to writing samples collected from prominent Caracas figures connected to Cuban exile terrorism, including Celsa Toledo Alemán, Gueton Oleg Rodríguez de la Sierra Tretiacooff, Luis Posada Carriles, and Orlando Bosch Avila. The report concludes that the script of the letter and the report belonged to the same individual, but that none of the writing samples matched the other names. Lugo also describes a “very nervous” Ricardo going to the bathroom twenty minutes after Flight 455 took off from Trinidad to Barbados. He took such “a long time” that an airline stewardess and a pilot had to knock on the door. When the plane landed, Hernan Ricardo “jumped from his seat and hurried to the door” to be one of first passengers to disembark. Once in Barbados, the two men checked into the Village Beach Hotel and left their luggage there. They then boarded a plane for Trinidad, where they spent the night in the Holiday Inn. On the morning of October 7, 1976, Ricardo gave Lugo U.S. $300 “to spend in Barbados and told me that if anyone asked me about that money to say it was mine.” They were arrested shortly thereafter by Trinidadian police. Ricardo instructed Lugo to tell the police that he had given 2,500 bolivares to Ricardo to purchase his tickets and that the $300 in Lugo’s possession was the rest of his money.